Tuesday 22nd. A frosty night led to a sunny morning as a light to moderate WSW'ly blew, this slowly backing into the SW as the skies clouded in during the afternoon. A lack of customers meant a late start, with John Carter taking the first of the day's 2 First Flight pupils for a 22 minute flight in the DG500 off runway 24, before taking the second for a 30 minute flight in the same glider. The day's flying was completed as Steve Thompson, having returned from hill soaring in Snowdonia, flew his Discus for 44 minutes, taking advantage of some weak wave that got him to climb a 100' or more over his launch height and allowed him to progess westwards as far as the East Coast main line. Wednesday 23rd. Another even colder night preceded a completely sunny day, the light to moderate WNW'ly slowly declining in strength as it backed into the WSW. Flying got under way just before 12oo noon as Steve Thompson took off in his Discus from a snow covered , runway 24, hoping, no doubt to find some more of the weak wave he had found on Tuesday. However, all he found was a lift less sky and landed back on runway 24 after 17 minutes. A further 7 ATs followed, 4 being for First Flight pupils, with only Paul Frost, with 2 flights in the DG1000 with John Carter, and Alan Beaumont, who flew the DG500 solo, making sure that more than one YGC member had his name on the flight log. The quiescent sky ensured benign flying conditions for the First Flight pupils but also led to none of the day's flights exceeding 30 minutes, even the Mile High flight flown by John Carter in the DG1000., with Tony Drury and Les Rayment providing supporting instructor roles. 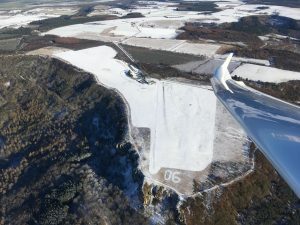 With clear blue skies, excellent visibilty and a snow covered terrain it was however a day to enjoy the beauty of winter outdoors, especially from the air, as the following photos from John Carte demonstrate. Thursday 24th. 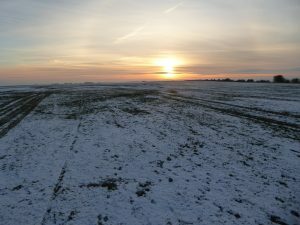 A 3rd consecutive night with the temperature below 0C, something of a rarity this winter so far, meant the airfield's cover of snow remained and the initially light wind from the NW led to a decision to operate off ruwnay 20 behind the Eurofox. 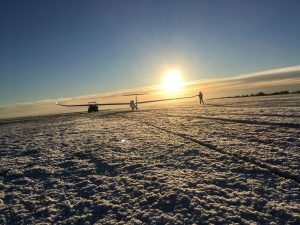 Chris Thirkell took the first flight solo in the DG500, the only glider used on the day, but prior to take off was briefed to land on runway 24 as the NW'ly had freshened. 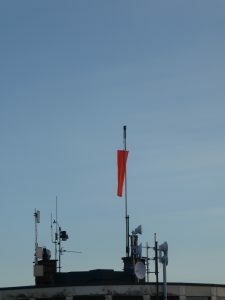 This he did after a launch to 3,000' QFE and a flight of 23 minutes. Operations were then scheduled to be off runway 24 but thoughts of flying were put on hold as a layer of stratus materialised at hill top height and visibility became very poor. 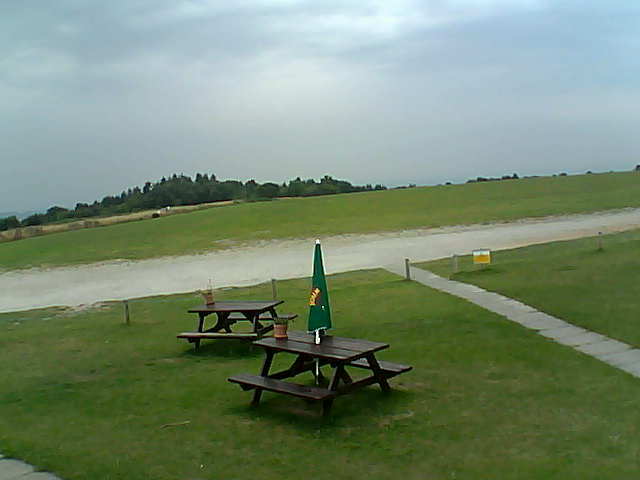 The stratus slowly cleared and the next flight off 24, now behind Pawnee EV, saw George Rowden take the first of the day's 2 First Flight pupils for a 23 minute flight. With conditions becoming increasingly sunny, visibility becoming very good, at least down sun and the wind becoming very light, Robert Spiller had a 20 minute flight, before the day's flying in the DG500 was completed as George Rowden took David Crane on a Mile High flight. 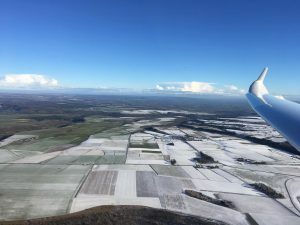 This included overflying David's farm just north of Thirsk and returning to land after 36 minutes, the flight even finding a transient bit of 2 kts lift just to the north of Gormire Lake as some low level Cu formed along the line of the ridge. The day's other flying included 2 sorties in the Falke, one of them seeing Peter Goodchild embark on some cloud flying training with Derek Smith, while Liam Watt flew in for a cup of tea and a chat before flying off again. 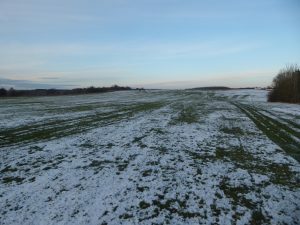 The wind conditions at the end of flying are well illustrated by the first of the following photos, while the slow greening of runway 20 is shown in the other photos as the temperature reached a maximum of 3.7C.